Learn to count from one to five in this rhyming board book featuring colorful disappearing touch-and-feel cupcakes! It's an eye-catching extension of Joyce Wan's adorable cupcake book with delectable spreads of irresistibly chubby, yummy characters, including a cup of cocoa, a rolling donut, and lots and lots of cupcakes. And at the end of the story you can't help but giggle and laugh with your little one as you practice counting down from five to one and back again. 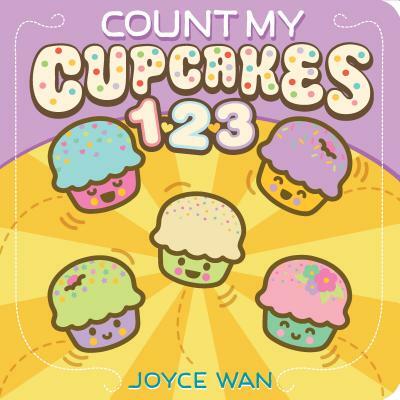 It's a scrumptious interactive first counting story to share with the littlest cupcake in your life -- from the one and only Joyce Wan! Joyce Wan runs her own stationery and gift business, Wanart, which sells products in thousands of boutiques, museum shops, and gift stores worldwide. She is also the author and illustrator of many children's books, including You Are My Cupcake, We Belong Together, Are You My Mommy?, and Peek-a-Boo Farm. Joyce lives in Ridgewood, New Jersey, but you can visit her at wanart.com.